These Instant Pot Chicken Tamales are ideal for any celebration. Incredibly tasty and ready in half the time, it’s hard not to love these yummy wrapped goodies. Hope you enjoy! Now that my dad is in Baja California, Mexico, we have a bigger Father’s Day celebration. Last year, we went to Rosarito, lobster, gifts and more. It was a lot of fun! Not sure what we’re doing this year yet. All I know is that I’m making Instant Pot Chicken Tamales. My dad is not much of a beef eater. That’s why I’m making tamales made out of chicken. This is cooked chicken that I made from scratch. You can very easily use rotisserie chicken. Just remove the skin. 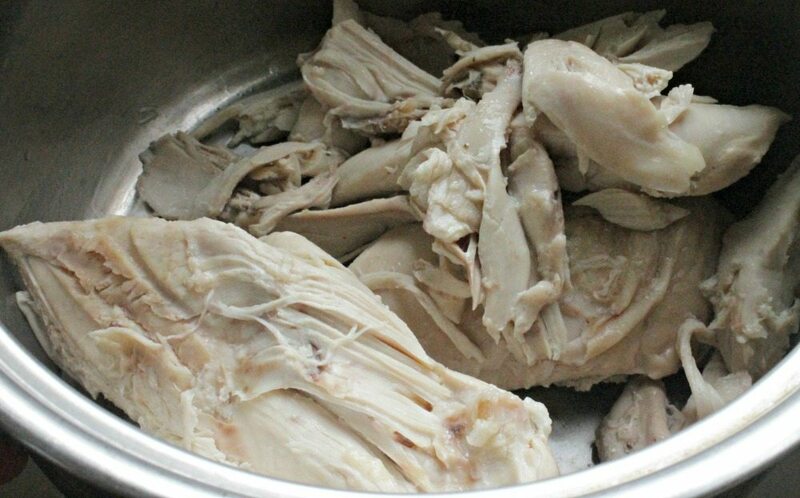 Another thing to do it make the chicken in a slow cooker or an instant pot a few days before. Making tamales is labor intensive. You want to make thing easier. That’s why I suggest making the filling a day (even two days) before the assembling happens. 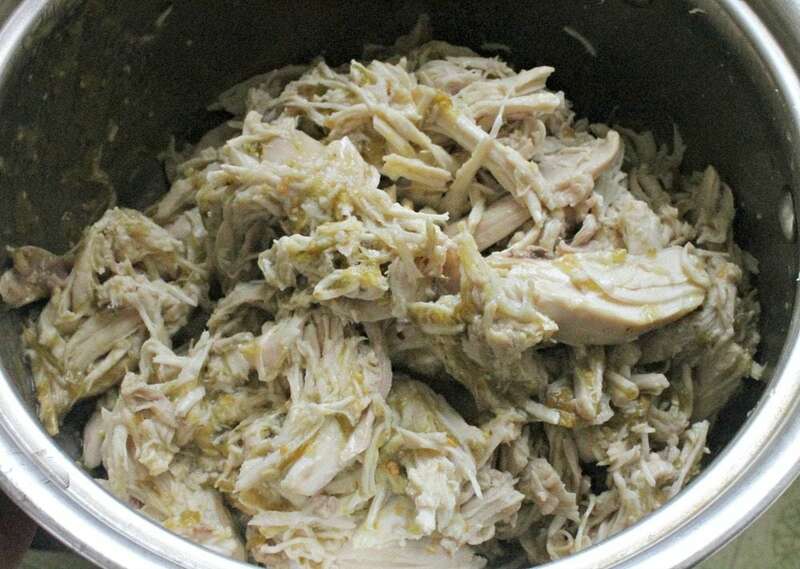 Shred the chicken and add the green tomatillo salsa. Cook on low heat. Make sure the mixture is wet. You want these to be saucy. Mexican food is all about the sauce. See the mixture in the picture? This might need to be more saucy for my taste. However, some people might like it this way. To each their own. Just add more chicken broth or more green salsa for saucier tamales. Whatever you do, taste your filling. If the filling is good, then you tamales will be good. Corn husks need to be soaked. Make sure you soak them with plenty of water. You can soak them for 20 minutes in warm water. If you do this, test them. Do the corn husks move easily? If so, great. You’re in business. If not, then add more hot water and let them soak longer. However, my preferred method is to do this overnight. Then the morning of, I drain them and soak them again. 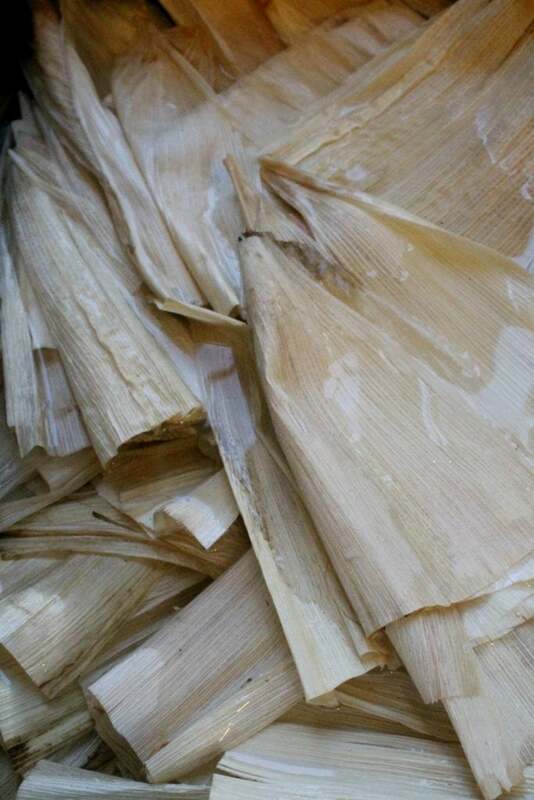 This way, the corn husks are ready to go and pliable to make Instant Pot Chicken Tamales. 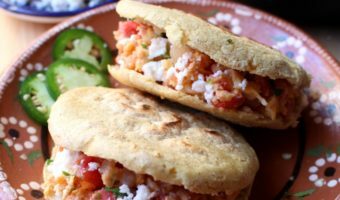 You can buy the masa already pre-made, or you can make it from scratch. 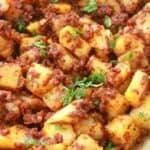 Here is my recipe and instructional video. Again, tamales can take hours to make. There’s no shame in buying pre-made masa. My mom buys pre-made masa all the time. It makes tamale making a lot easier. Unless she’s cooking for my younger brother who is a vegan. In that case, she makes Masa with Olive Oil which is completely vegan and 100% better for you than the lard kind. 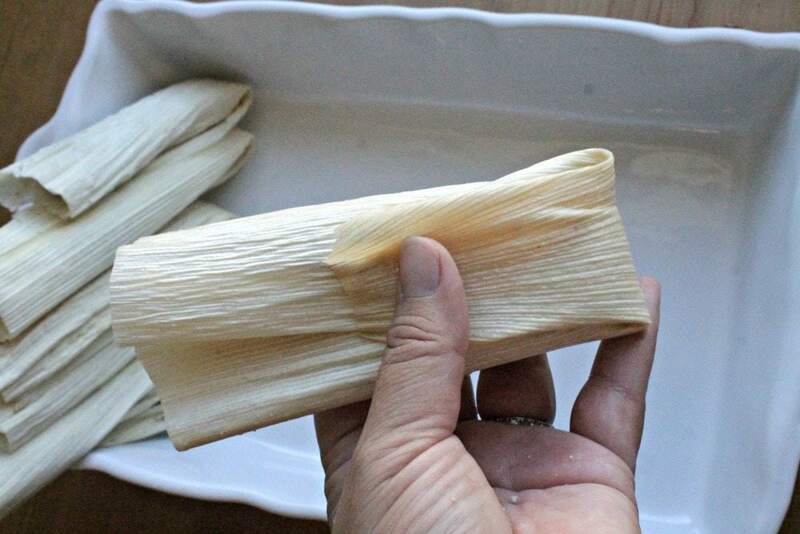 Because we are making these tamales in an Instant Pot, make sure to fold them shorter than longer. The tamales can be fat, but not too tall, or the lid won’t fit. You want your tamales to be cooked upright. 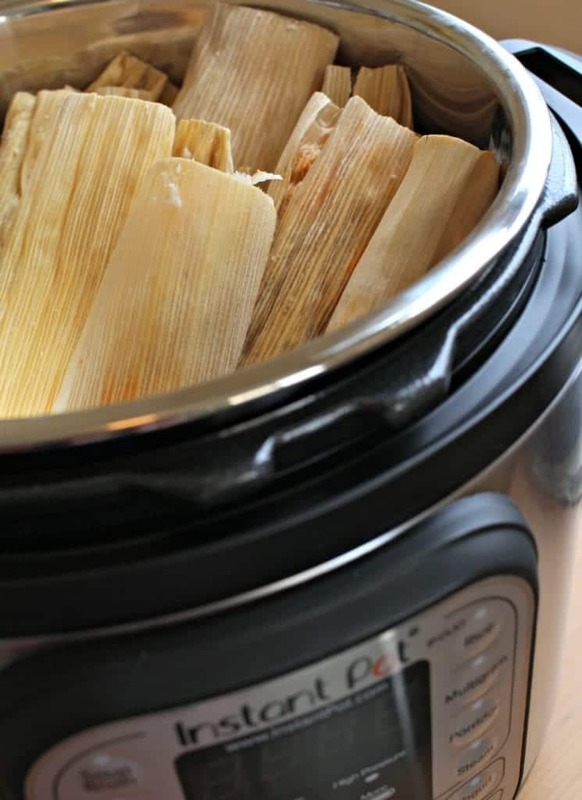 Long tamales will need to be cooked at an angle and less tamales will fit the instant pot. Assembling tamales is not difficult. It just takes practice. I’m not into tying a knot around the tamales. Tamales are labor intensive enough. You don’t want to make it more complicated for yourself. 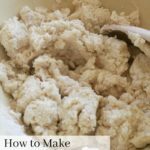 I have plenty of videos on how to make tamales. Here’s a video on how to make Instant Pot Red Pork Tamales. 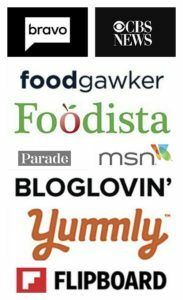 The Instant Pot is the best thing ever! Just saying..
Add water to the bottom. This is only 1 cup of water. When you buy an instant pot, it comes with the crate you see here. 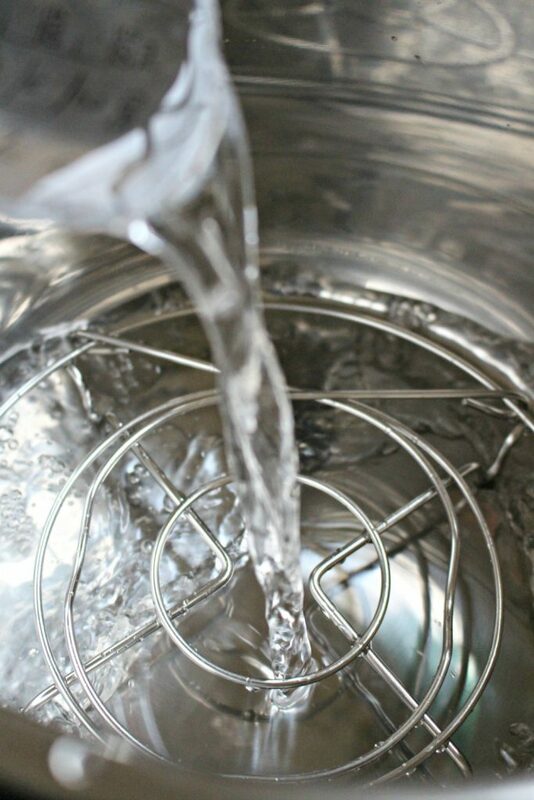 Traditionally, tamales are made in a steamer. You don’t need a steamer in this case. However, they do need to stand up with the open-side facing upward. Assemble the tamales inside. Then place the lid. These Instant Pot Chicken Tamales are going to be delicious. I love tamales. Don’t you?! Get a little help from your friends. Invite them over to help with the assembling. Things will go faster when you’re chatting away. Unless you are making a small batch like in this recipe. 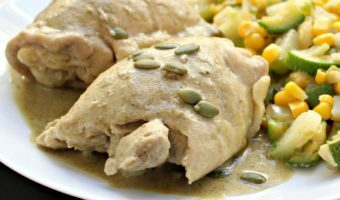 These Instant Pot Chicken Tamales are perfect for a small dinner party or a celebration dinner. Remember the hours and hours it normally takes tamales to cook? Well, these Instant Pot Chicken Tamales were done in half the time! Awesome, right?!! I couldn’t believe it. If you cut the cooking time, you can eat faster. I’m down for that!! I made frozen tamales using Pressure Cook + 45 minutes and full release. I let them sit in the instant pot for 5 minutes before I took them out. They were perfect. I made fresh tamales using Pressure Cook + 35 minutes and full release. I immediately removed them, and they were perfect. Here’s something I suspect: I believe that you can make Instant Pot Chicken Tamales for less time, but I have not tested less. The reason I suspect this is because I made a large batch. If you are making a small batch, try 30 minutes. If they are not fully ready, then return them for another 5 minutes. How Many Tamales Can I Make? I was only able to fit 16 large tamales in the instant pot. However, you might be able to fit more if, depending on the size. My advice to those of you who want to make more Instant Pot Chicken Tamales is to make them in batches. That is, make one batch of tamales. Serve them to your hungry family and guests. Then make a second batch. If you are making these Instant Pot Chicken Tamales for a party: Take out a large pot or a large serving platter. Place the tamales as they ready on the platter or in the pot. Make sure to cover them to keep them warm. The other thing I would do is make them ahead of time, freeze them, then reheat them the day of the party. 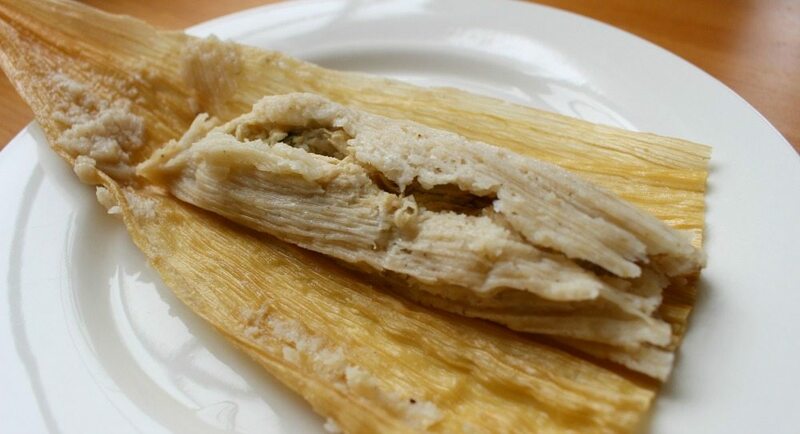 You can freeze COOKED tamales for up to 4 months. Freshly cooked tamales last up to 5 days in the fridge. Taste the authentic Mexican flavors in these delicious Instant Pot Chicken Tamales. Makes for a yummy family dinner or for a special occasion. Enjoy! Shred the chicken and add to the pot. (If you like it saucier, add the chicken broth). 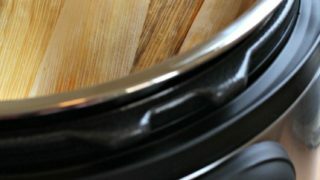 Place the steam rack crate on the bottom of the Instant Pot. Place all the uncooked tamales on the rack, standing upright. Turn the valve to "SEALING." Set the Instant Pot to pressure cook at high pressure 35 minutes. When the pressure cooking is done, let the steam release for a few minutes. Then turn the valve to "venting." It will release any leftover steam. Remove the lid very carefully. Place tamales on a plate. For frozen tamales, press the Pressure Cook feature for 45 minutes. Full release and let stand for 5 minutes before eating. I was only able to fit 16 large tamales in the Instant Pot. You might be able to squeeze in more, depending on the size. If not, make a second batch after first batch finishes cooking. It’s really not that hard to make tamales. It just takes a long time. Check out the video here: https://inmamamaggieskitchen.com/red-pork-tamales/ It has a step-by-step video on how to make tamales. Good luck! I’m drooling over here! I love love love homemade tamales! Your recipe looks amazing! 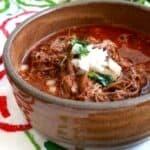 I love that you made them in an instant pot because I have an instant pot! 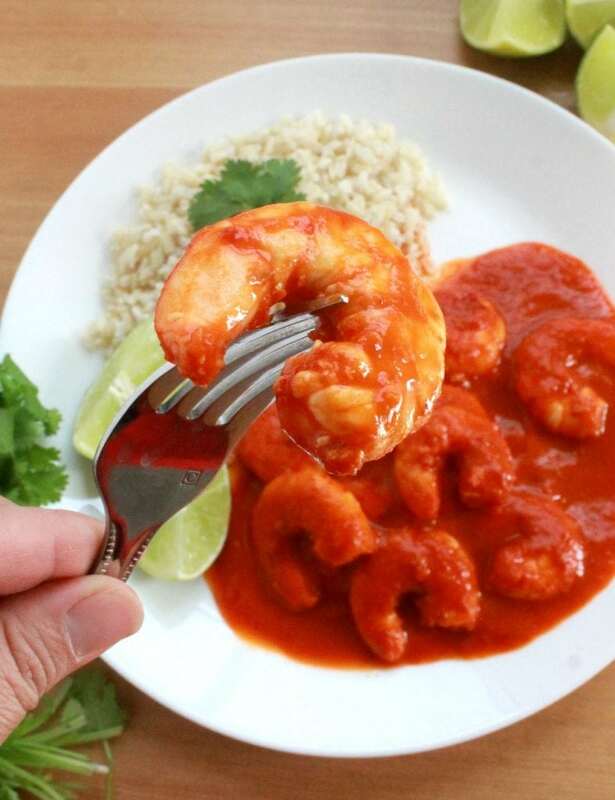 Pinning this recipe to make ..YUM! We cook with a lot of chicken. We have been using less beef. This is a meal I think whole family would enjoy. Yes! I mean who doesn’t love chicken tamales. lol. Especially when they are done quicker. Yummy. 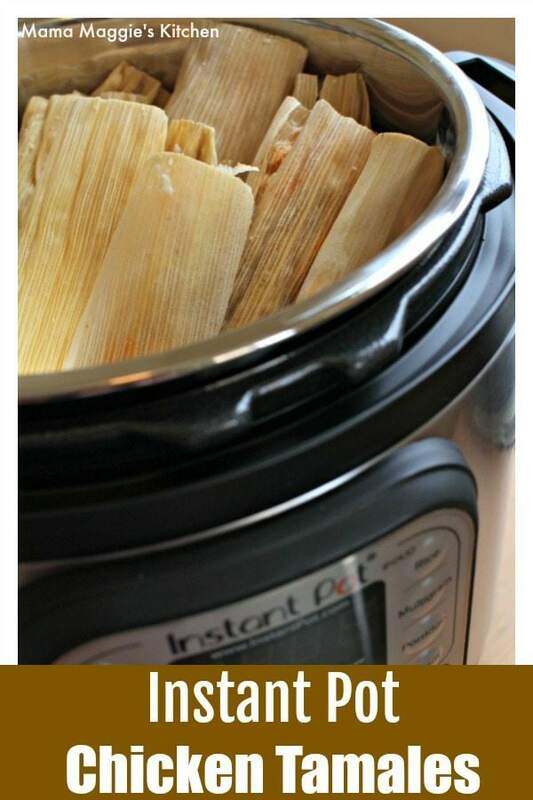 An instant pot would be perfect for making tamales. These look so delicious. Right! I seriously couldn’t believe how easy it was to make Instant Pot Chicken Tamales. I love my Instant Pot. Not sure I ever thought Tamales could be made in them. This is an awesome revelation!